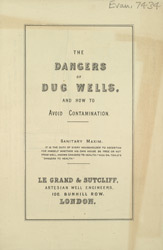 This is an advertisement for the services of Le Grand and Sutcliff, artisan well builders. Ensuring that there was a clean and pure supply of water was an essential part of daily life in 19th century Britain. Piped water was not available in the home until the last decade of the century and before this water was collected in buckets from wells. The Victorians had begun to understand that diseases like cholera could be spread through water and so became more aware of the sources of their water supplies. Deep wells would be dug to make sure that the water obtained from the well was clean and uncontaminated.